You may think of county fairs as a summer thing, but there are nearly a dozen county and fair fairs to enjoy in September! Enjoy the first taste of fall with a (dizzying, and/or fried) thrill. Drive in a NASCAR simulator, study art carved by chainsaw artists, and see who wins the most beautiful baby competition at the Prince George's County Fair. Tickets are $6 for adults, $5 for kids ages 6-11, and free for kids 5 and younger. Want to shop a massive flea market? Or maybe you're looking to compete in the Arundel's Got Talent contest? Then head on down to the Anne Arundel County Fair. Tickets are $7 for adults, $5 for kids ages 15-6, and free for kids 5 and younger. Discounts are available. Like a museum outdoors, this county fair offers countless exhibits: from rabbits, sheep and cattle to quilting, needle art and clothing. Lawnmower racing and sheep shearing are also featured. Tickets are $5 for adults, and free for kids ages 10 and younger. Day passes are available. Stars such as Jeff Foxworthy, Kellie Pickler and Chase Bryant collide (but not literally) with epic Demolition Derby for this all-out country-inspired county fair. You can also bring home a prize cake from the cake auction. Tickets are $8 for adults and free for kids ages 10 and younger. Discount days are available. 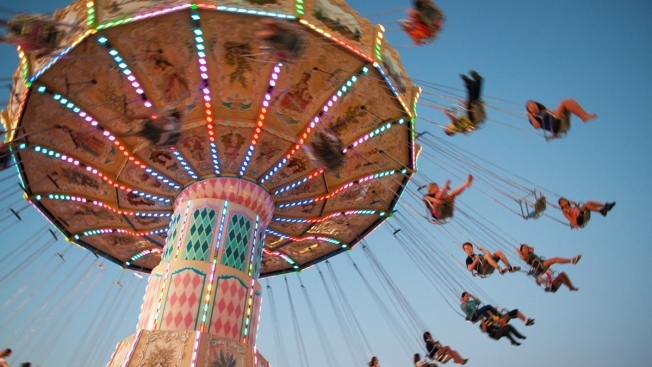 Carnival rides share the fairground with abundant 4-H competitions, as well as horse shows and pig racing. A special feature of this fair is the "Queen of Tolerance," chosen to remind Marylanders that their state originally sheltered the Catholics who escaped persecution -- hence the state nickname "The Free State." Admission is for adults are $5, $1 for kids 6-12, and free for kids younger than 6. Carnival rides are extra. Sorry to tell you this, but most of Northern Virginia's county fairs were in August. However, there are plenty of Maryland county fairs to enjoy, as well as all of the state fairs. Check them out below! This year, the D.C. "State" Fair holds its first-ever pet parade, inviting you to bring your friendly pet on a leash, or in a cage, tank, or aquarium to the event. Costumes are encouraged for you and your pet, although not required. Other fair contests include honey, home brews, pies and flower arrangements -- and even a pot- growing competition called "Best Buds." Admission is free. Established in 1878, the Maryland State Fair invites visitors to take a seat in the grandstand and catch a horse race. Demonstrations and an exhibition hall feature prized livestock, quilts and more. Tickets are $8 for adults, $3 for kids ages 11-6, and free for kids 5 and under. Discounts available. Petting zoos, featuring rabbits, cows, doves and Virginia-area fish, are only a few of the attractions this grand state fair has to offer. Country bands including Jackass Flats, Steep Canyon Rangers and The Tams will also be performing. Tickets are $12 Mondays-Thursdays and $15 Fridays-Sundays for adults. Admission for kids ages 12-5 is 8 Mondays-Thursdays and $10 Fridays-Sundays. Discounts days and early bird specials available. Rides cost extra.